Excellent linen quality and the color is just as it appears online. It coordinates well that the rest of my linen bedding. I would definitely recommend these. Bring a touch of elegance into your home with these chic and beautiful Euro shams. The shams are crafted from 100-percent Belgian flax linen. Perfect for bedding, the rich texture is durable and becomes softer and more luxurious over time. The prewashed shams can be tumble dried for a casual look, or ironed for a more pristine design. Versatile and elegant, these shams will elevate the look and feel of your bedroom. 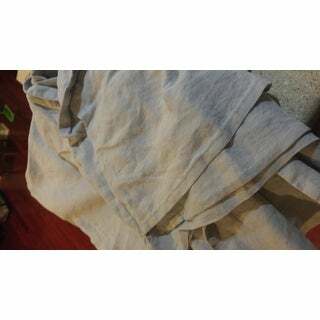 These shams are prewashed and will become softer with regular use and washing. High quality linen. I love this linen mateirl and how ordered the euro shams, standard cases, 2 duvet sets, and 1 set of sheets. High waipity linen for a fraction of the price elsewhere. Gets softer with time and each wash. I wish the euro shams came with the duvet instead of king shams. I also wish the euro shams had a Iight ruffle around the edge and/or tied with bows or buttons in the back. 4 stars because there aren't bows or buttons to tie the shams closed. They stay fairly well on their own. But the buttons/ties would add to the French country look of the shams. Love them! I will be ordering more linen from this line. Love these Euro shams, completes the look of my bed. Linen is soft, and you can't beat the price for a linen shams. Extremely disappointed with my order Belgian Linen Euro Shams. Paper thin see through material. I know they are linen, but not well-made and threads coming apart.. These shams are beautiful in person! I love the color and the feel of the linen. Amazing! Perfect color! I am so happy I purchased these shams. Easy to use and wash. These shams are part of an entire set I bought that includes a duvet cover and sheets. I went with a combination of the slate and pearly grey. They are just as pictured, quality is amazing and super soft. I followed the washing instructions, no problems. I'm a linen lover and this is some of the finest I've found. I bought the matching duvet cover and sheet set for my king bed in the white colour and I love all of them. Its a great set but not sure why they had to be sold in a pair when they were delivered as individually wrapped shams. I now have an extra lonely sham. 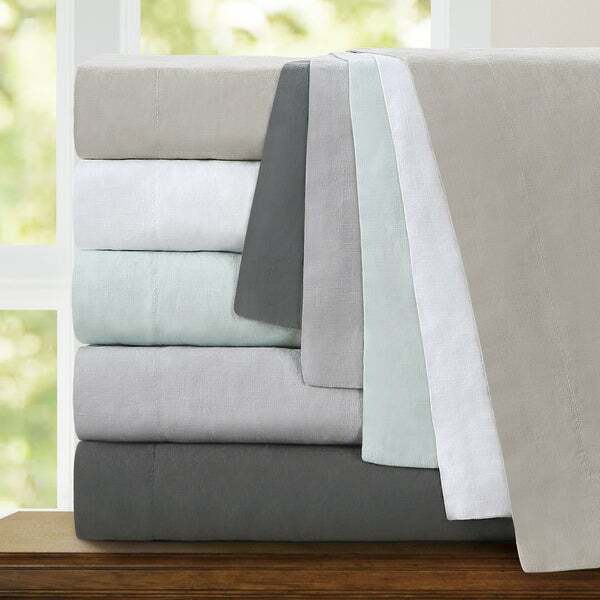 Lovey quality linens that wash and wear really well. They look like they cost a lot more money than they did and are as good as comparable products three times the price. These linens are getting softer the more they are used. Really great purchase. Great value and quality. These linen shams worked perfect with the linen duvet I purchased from Overstock. Highly recommend them. They easily compare to many high end 100% linen bedding priced much higher. I love linen sheets in general. We have slept on linen sheets for 7 years now. They are warm in winter and cool in summer. I also like how they feel against my skin. I have bought several sets of these sheets for myself but I also gave them as Christmas gifts this year to my daughters in the indigo color. The weight is substantial and they feel luxurious and they come in really nice colors! Really nice quality for the price ! Very nice pale grey color. Nice quality. The quality was not as expected. Returned the set. Do not recommend. The sham are well made, but very big. You'll need an overstuffed pillow to fill them. Those are wonderful! Great color and fabric. The only disappointment are the pillows inside them. I love linen and want shams for my pillows in my guest room so when I remove the sham there is no dust on the pillow. To match my duvet and shams! "Is the eggshell white actually white?" Yes it is snow white! I love it! It's not bright white. It is an eggshell white. "Does this include the sham insert or is it just the pillowcases?" Just the pillow cases. They do have a very linen look. Natural. But do get wrinkled easily! "I would like 2 white euro shams, is this possible?" The eggshell white option is currently out of stock.